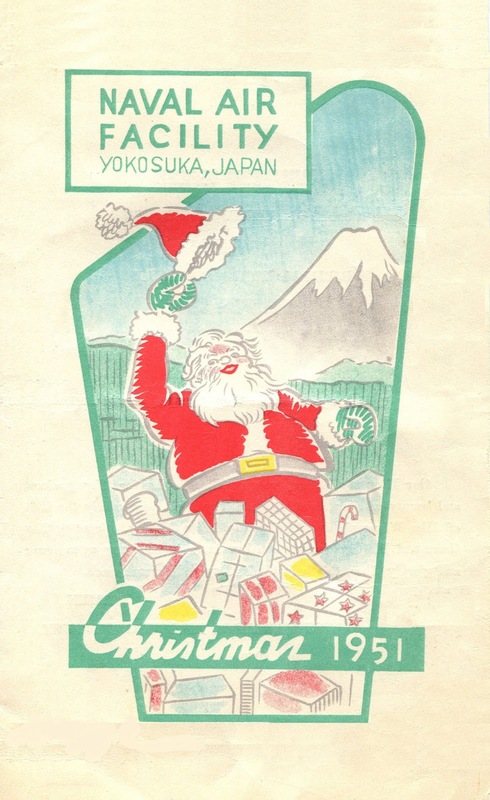 This cover illustration, showing Santa Claus flying through a Japanese gate toward Mount Fuji, represented a new style of graphic design. 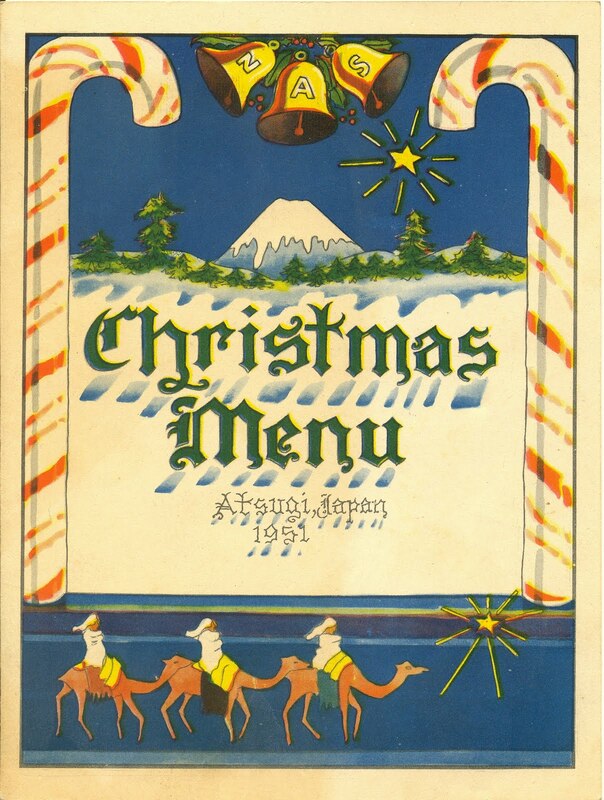 It appeared on a Christmas menu at the U.S. Tachikawa Air Base in Occupied Japan in 1949. 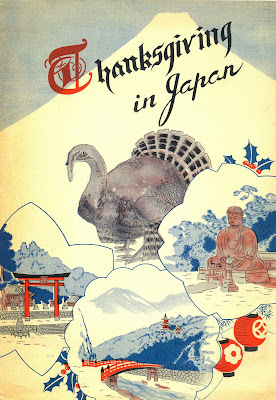 What was different about it was that it showed Western holiday images in the same pictorial space with the iconic symbols of Japan. This exuberant scene stood in stark contrast with the deep despair that had been prevalent in Japan during the years immediately following World War II. 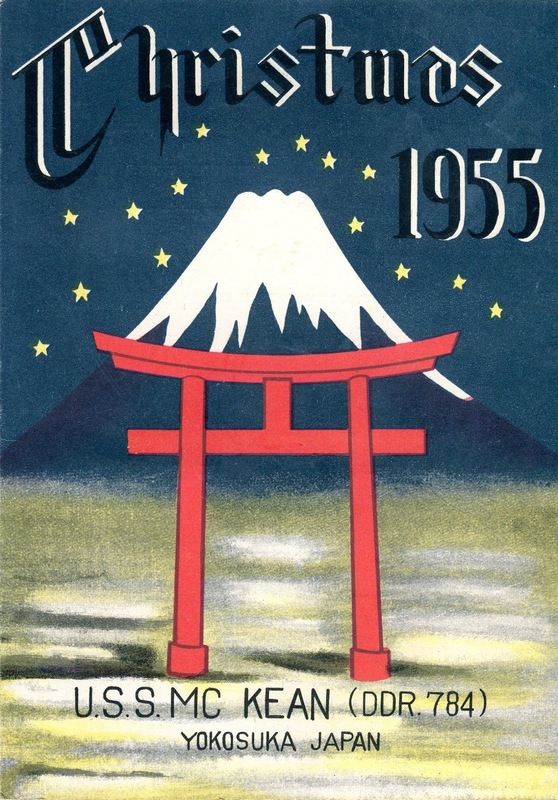 By the end of 1945, more than 350,000 U.S. military personnel were stationed in Japan, supervising almost every aspect of civilian life. Sometimes called the “Confusion Era” in Japanese art history, this chaotic period was also disorienting for the Americans who participated in the Occupation. 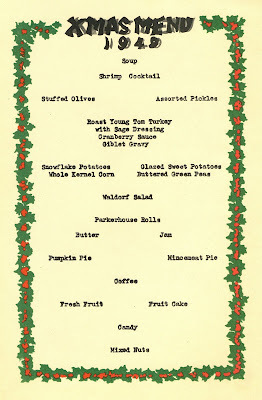 However, by the time this Christmas menu appeared, the situation had improved considerably. 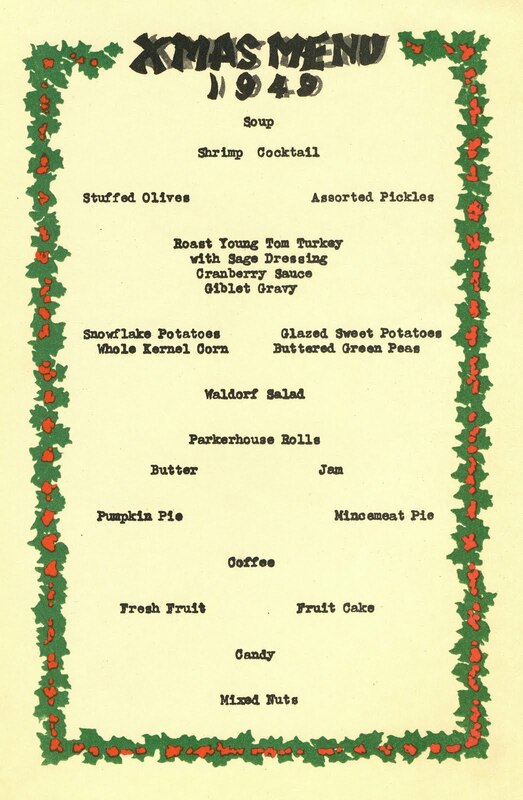 The U.S. military provides traditional holiday meals on Thanksgiving and Christmas to troops throughout the world. 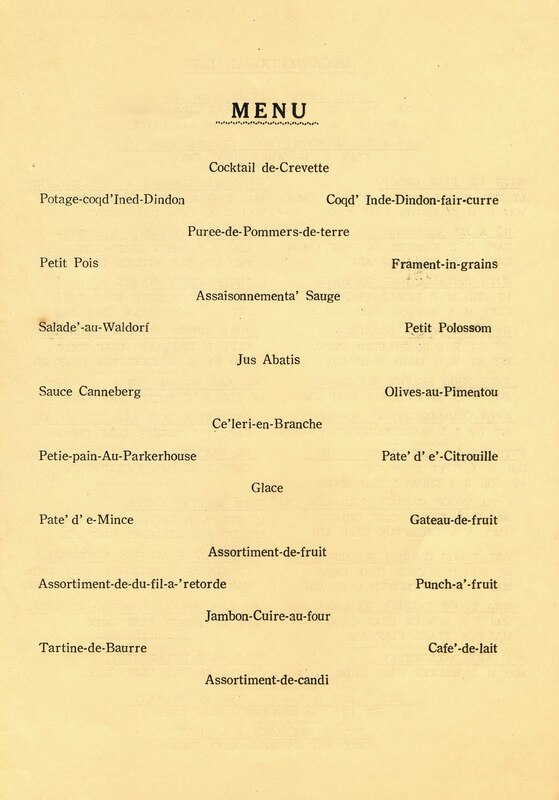 Since the food is usually the same, it is often the other information on these menus that makes them interesting. 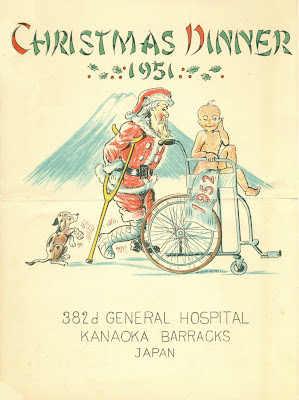 Normally, the illustrations employ typical holiday imagery, or depict some aspect of the place where the unit is stationed. 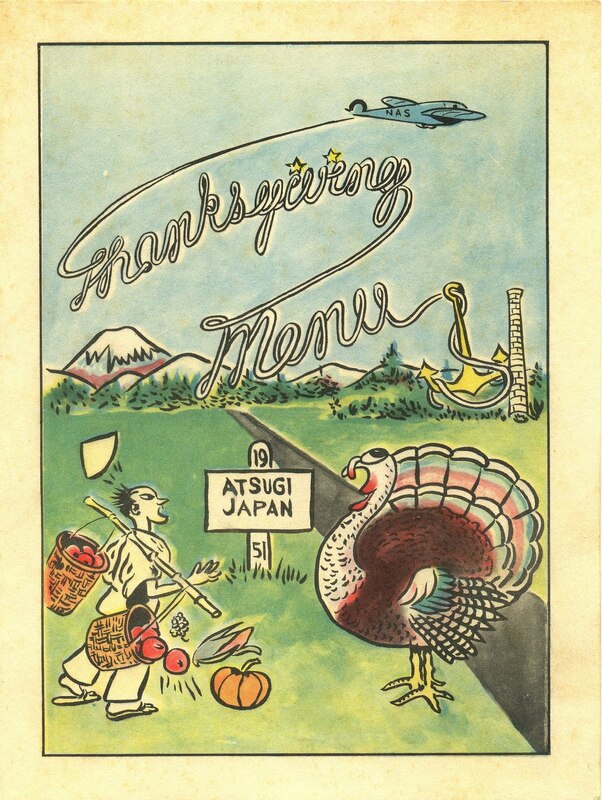 However, in 1949, during the fifth year of the Occupation of Japan, whimsical designs mixing both themes began to appear on holiday menus at the American bases. 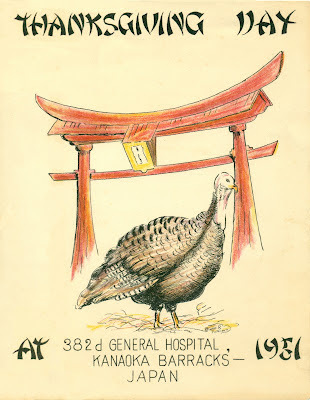 Suddenly, things like turkeys, pumpkins, and candy canes were being depicted in the local setting. Lasting only about four years, the new design motif expressed a growing awareness of the culture and natural beauty of Japan. 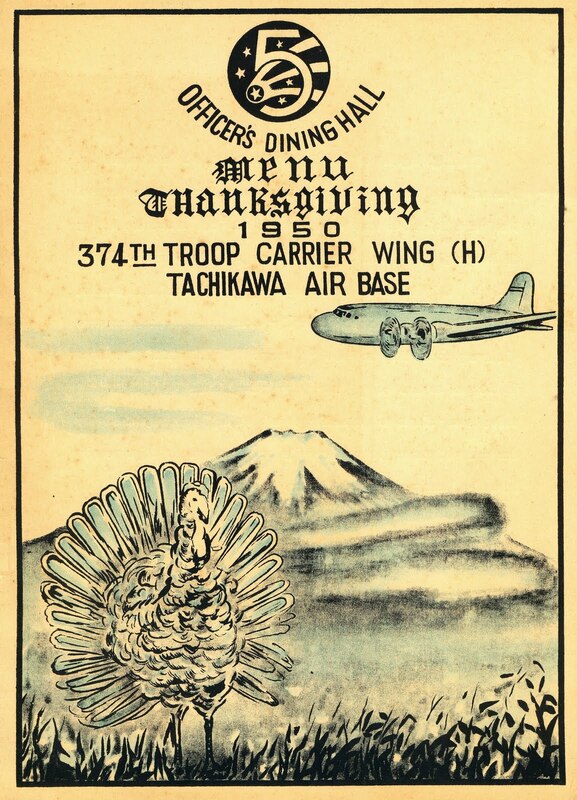 The 1950 Thanksgiving menu below features a C-124 Globemaster II flying in the middle distance between Mount Fuji and a turkey. 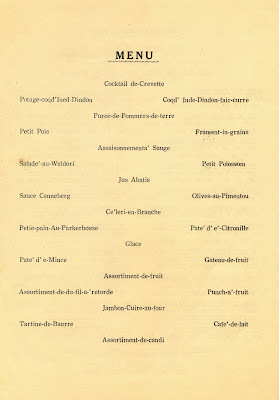 In addition to the strange juxtaposition of images, there is something else that is particularly unusual about this menu. 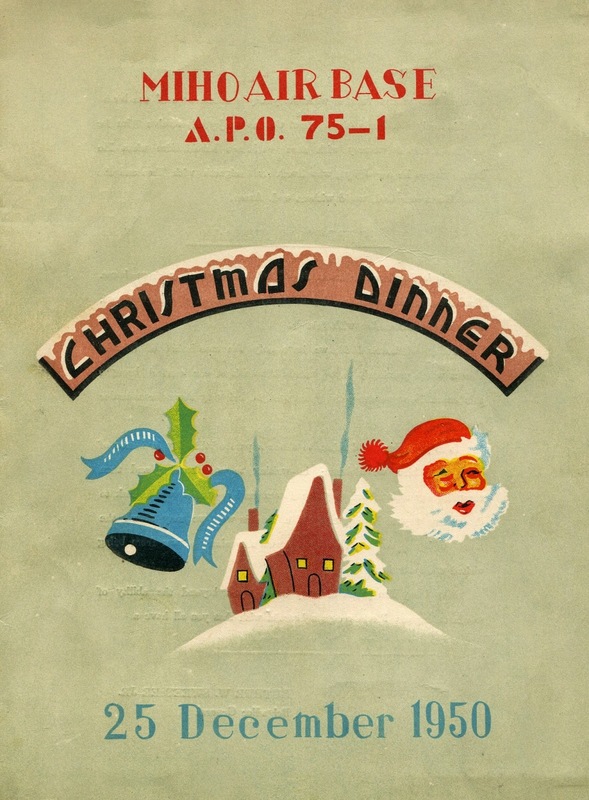 Ironically, Colonel Troy W. Crawford concludes his holiday message with the exhortation, “Let us be Americans in everything we do or say,” ignoring for the moment that the bill of fare is printed in French, something rarely seen on a U.S. military menu. 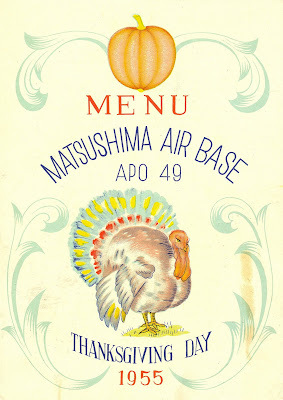 The idea of using the iconic imagery of both countries on the same menu spread to the Miho Air Base in Yonago in 1950. However, the designer was not yet ready to take the leap and arrange them within the same pictorial space. 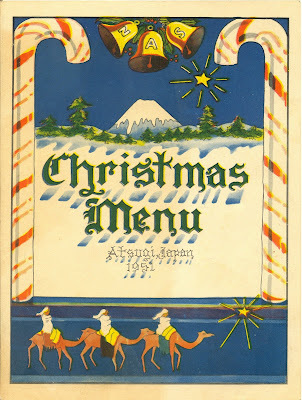 This Christmas menu shows a few Western items on the front cover, and one from Japan on the back. 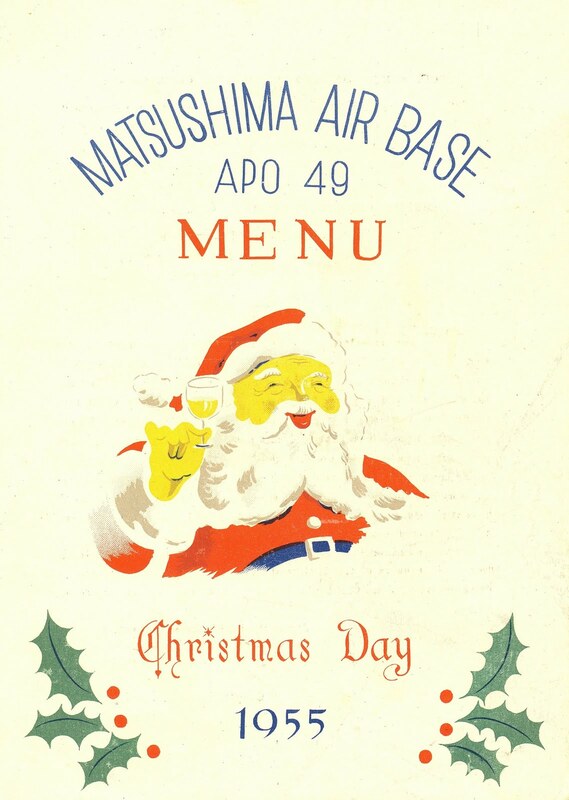 The holiday menus at the Naval Air Station at Atsugi in 1951 show the complete integration of the symbolic imagery on the front covers. 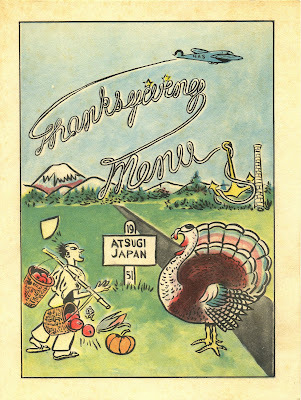 On the Thanksgiving menu, a local farmer is startled by a goofy turkey, or possibly the jet flying overhead, dropping a basket of vegetables normally associated with the American holiday. Mount Fuji, the preeminent symbol of Japan, can be seen in the background. 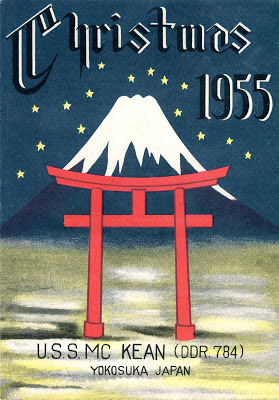 For Christmas, the illustration features the Star of Bethlehem shining in the night sky over Mount Fuji—a peaceful scene framed in candy canes. The 1951 menu below from the Naval Air Facility at Yokosuka uses Mount Fuji as the backdrop for this Christmas scene. 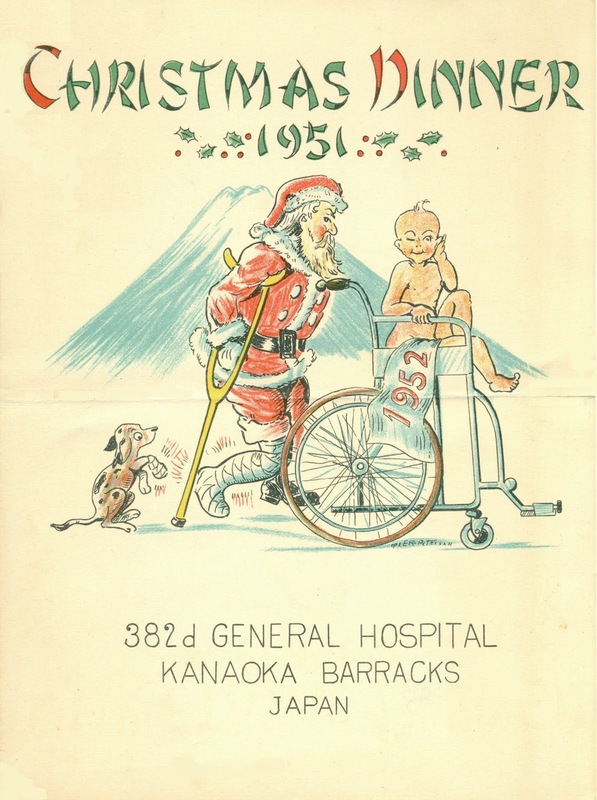 Below are the holiday menus from the 382nd General Hospital in Osaka in 1951. 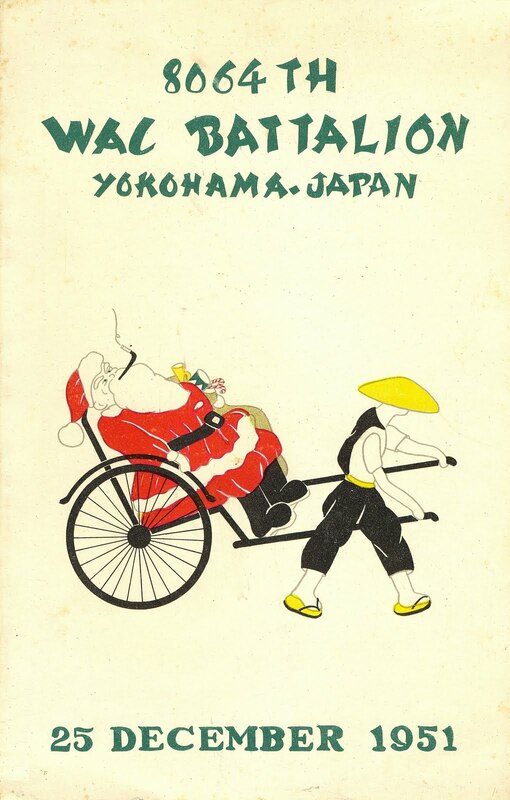 Although the rickshaw is not an icon of Japan, the Women’s Army Corps at Yokohama clearly got into the swing of things, expressing a playful mixture of East and West on their Christmas menu in 1951. 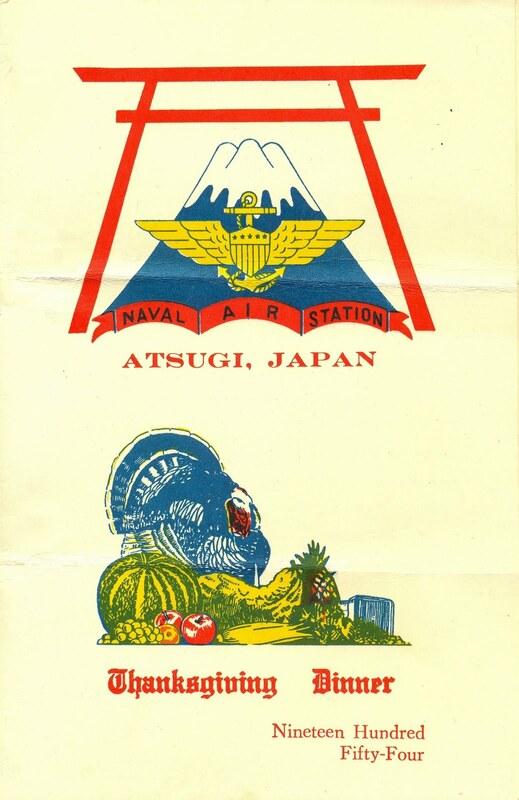 After the official Occupation ended in 1952, various units of the U.S. military remained in Japan at the invitation of its government. 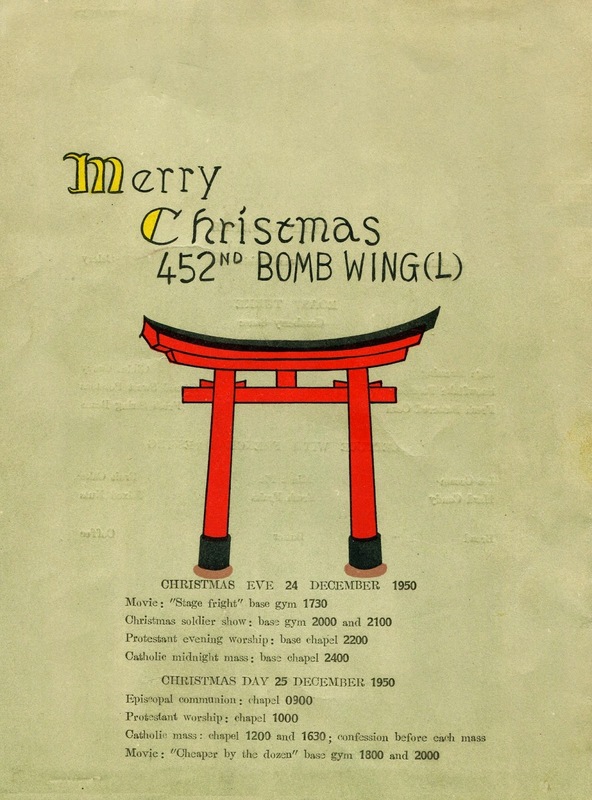 Although some holiday menus were not printed, such as this plain, mimeographed menu from the Far Eastern Air Material Command at Tachikawa, the multicultural theme remained the same. The menu below from Thanksgiving 1953 the 6412th Air Base Squadron features an enormous turkey looming behind various vignettes of classical landscape scenes. 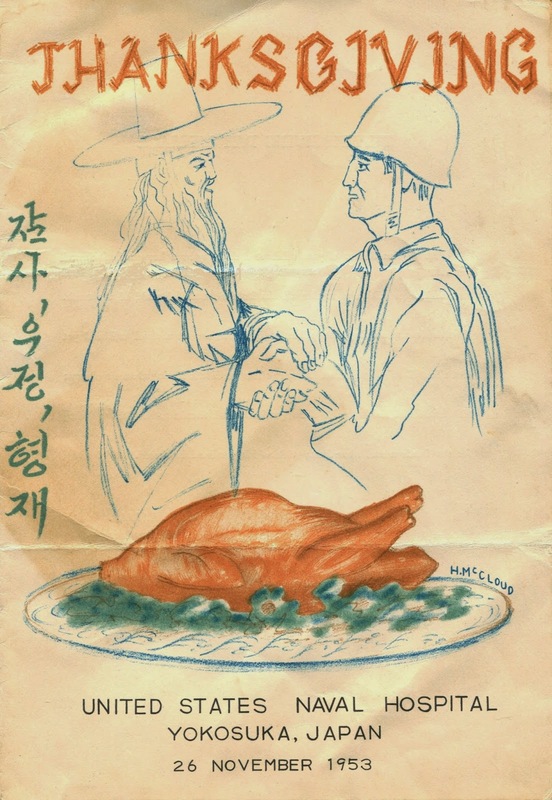 The East-West meeting depicted on the cover of the Thanksgiving menu at the U.S. Naval Hospital in Yokosuka is particularly unusual. The menu below from Christmas that year at the Marine Helicopter Transport Group in Hanshin evokes a cheerful feeling. 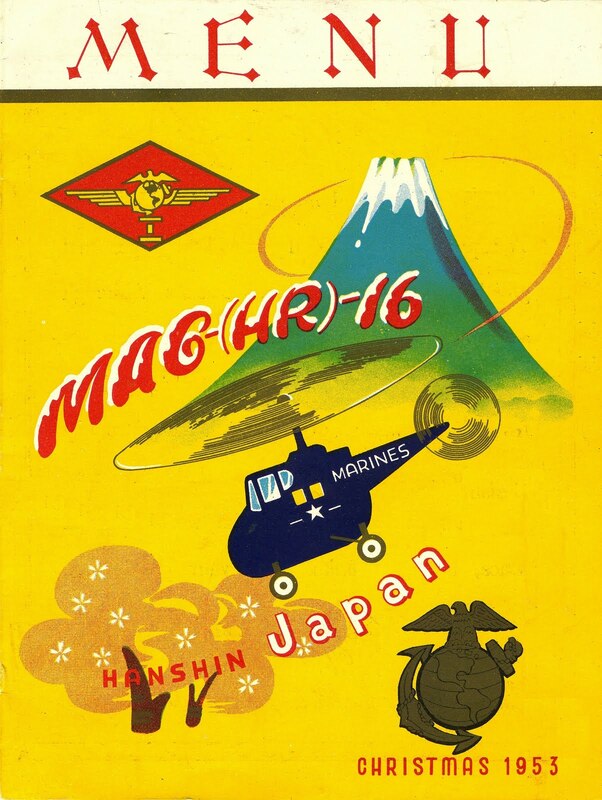 Reminiscent of the annual spring holiday called Golden Week, this scene shows a helicopter buzzing over cherry trees near Mount Fuji; the word “Christmas” provides the only indication of which holiday is being celebrated. 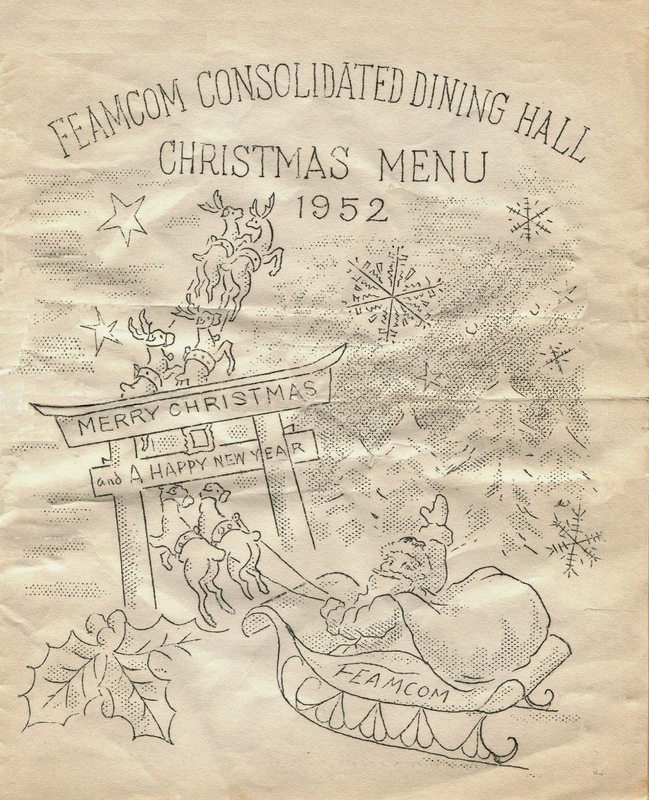 The transformation can be seen on this Christmas menu in 1955 on the U.S.S. McKean moored at Yokosuka. 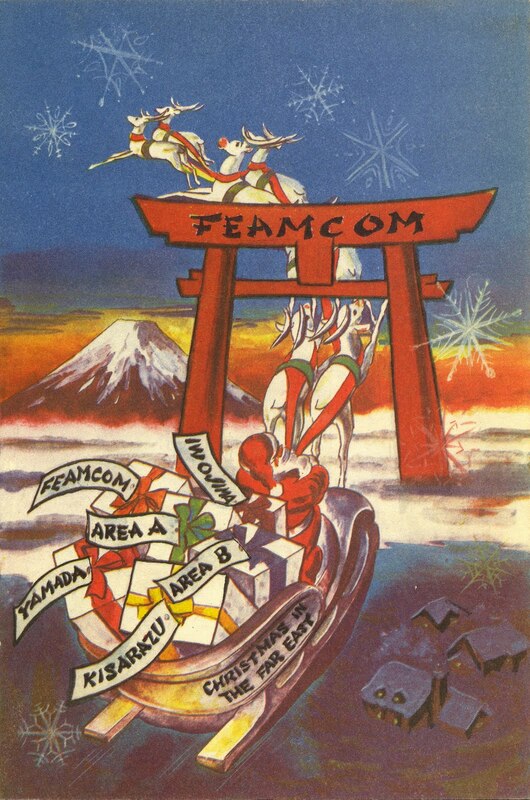 The cover exclusively features the symbols of Japan; there are no Western references. On the other side of the coin, the holiday menus that year at the Matsushima Air Base contain no visual reference to Japan. Although both countries learned about each other during the Occupation, Colonel Crawford need not have been concerned about the men in his command, for Americans were going to be themselves in everything they said and did, even when it came to expressing their appreciation of another culture by using the irreverent humor of their own.